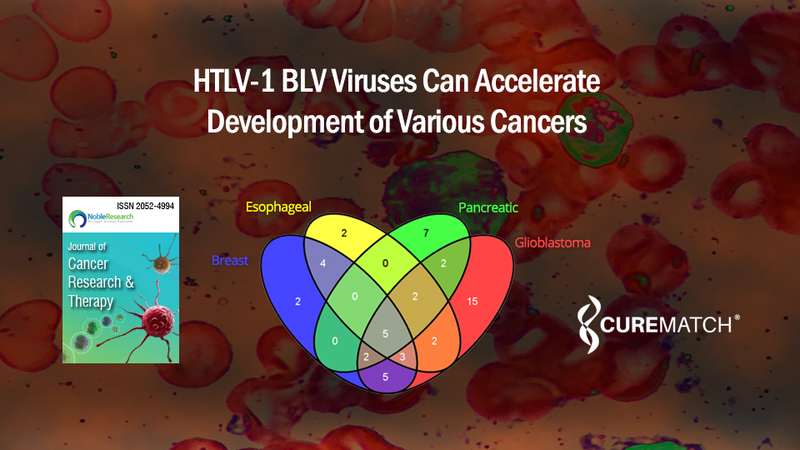 CureMatch’s co-founder and Chief Science Officer, Dr. Igor Tsigelny contributed to recently published cancer research concerning impact of viruses HTLV-1 and BLV on development of various cancers which could prove helpful to future CureMatch work. Findings are hopeful that it may be possible to eradicate these viruses acceleration of various cancers. The human T-cell leukemia virus type 1 (HTLV-1) is known to cause a rare cancer of the immune system’s T-cells called adult T-cell leukemia or ATL in about 5% of those infected. Researchers hypothesize that this virus, as well as another lesser-known “cousin” called bovine leukemia virus (BLV), may also play a role in the accelerated development of breast cancer, esophageal cancer, pancreatic cancer, and glioblastoma (brain/spinal cancer) around the world. In a Journal of Cancer Research and Therapypaper published last month called HTLV-1 Can Be Involved in Acceleration of Different Nonhematological Cancers, Valentina Kouznetsova, Steven Chen, and Igor Tsigelny proposed the necessity of studies related to HTLV-1 and BLV affecting other cancers. Kouznetsova is a researcher affiliated with SDSC and on staff at the Moores Cancer Center, while Tsigelny is affiliated with both SDSC, and Moores, Chen participated on the research team via the SDSC’s Research Experience for High School Students (REHS) summer internship program. “One of our interesting findings was that HTLV-1 infected patients in southern Japan without any manifestations of ATL-developed various cancers correlated with the possible HTLV-1 proteins influencing a set of cancer pathways equivalent to cancerogenic mutations,” said Kouznetsova, the lead author of the study. 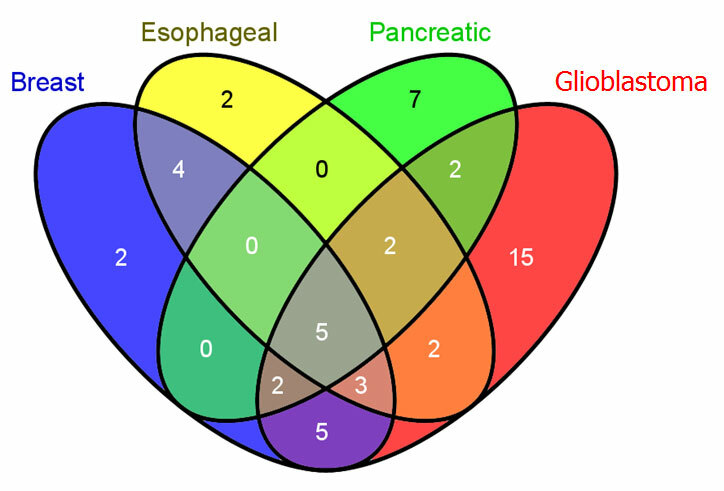 This Venn diagram depicts the common significant pathways in all four cancers: HTLV-1 infection, pathways in cancer, pancreatic cancer pathway, chronic myeloid leukemia pathway, and bladder cancer pathway. Image credit: Steven Chen, SDSC/REHS. Similarly, BLV is spread from infected cattle to non-infected cattle by direct contact or exposure to blood. While BLV is not believed to survive pasteurization, the virus has the potential to be transmitted from an infected cow’s raw milk to a human. Likewise, the virus may also be able to be transmitted from an infected cow’s undercooked meat to humans. While the cattle industry strives to keep infected cattle segregated from healthy cattle, several studies have found BLV in breast cancer tumors. According to researchers at Michigan State University (MSU), as of 2018 BLV was prevalent in about 43 percent of all U.S. cattle. However, BLV has been completely eradicated in more than 20 nations, most of which are in Europe, and their efforts can be used as models for implementing several control strategies. Large Animal Clinical Sciences Professor Paul Bartlett at MSU is currently conducting several field trials in which the most infectious cattle are culled or segregated to reduce transmission. While efforts to eradicate BLV in cattle are important by themselves, the research done to date by Kouznetsova, Chen, and Tsigelny have the potential to eventually mitigate multiple cancers’ acceleration caused by those infections. Tsigelny, along with his work at UC San Diego, is the Chief Science Officer and co-founder of CureMatch, a company which provides decision support for doctors in personalized cancer medicine. SDSC Director Michael Norman is a member of the CureMatch Advisory Board. No grant funding was used for this study. The Journal of Cancer Research and Therapeutics is a peer-reviewed open access medical journal published by Medknow Publications on behalf of the Association of Radiation Oncology of India. The journal covers research in oncology, radiation oncology, medical imaging, radiation protection, non-ionising radiation, and radiobiology.